01. IKEA Rocking Moose: I bought this around Christmas time, because I thought it could pass for a reindeer... Liam loves rocking on this bad boy, and he hasn't fallen off yet. I consider that a win! 02. 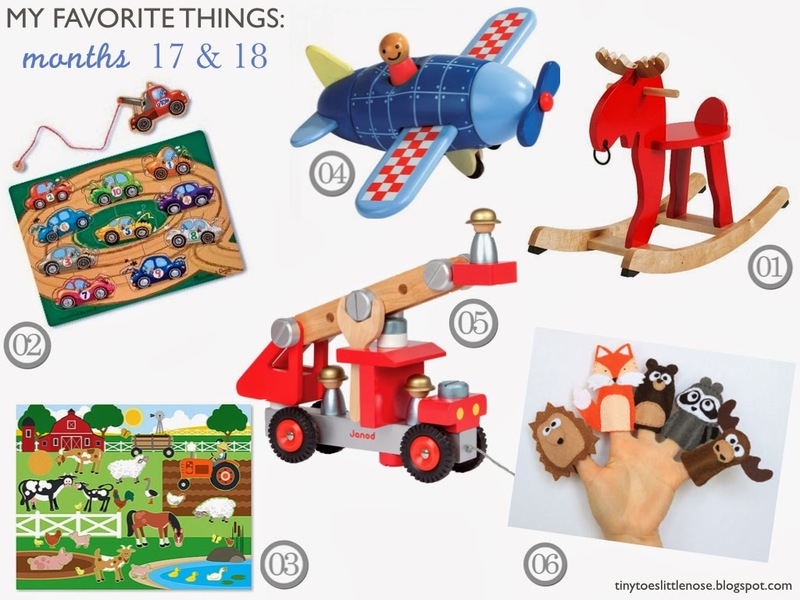 Melissa & Doug Tow Truck Puzzle: This is his absolute favorite puzzle! It is more difficult than most of his others since there are no pictures behind the cars, so you are really just matching the shapes. The fact that there is a magnetic tow truck to remove the pieces just rocked his world! I can also use this puzzle to talk about letters & numbers, so I know that it will grow with us. 03. Melissa & Doug Reusable Sticker Pad: I was a little skeptical about this at first. Liam loves stickers, but I always thought that was because they were, in fact, sticky! Apparently that is not the most important factor, because he is all about this sticker book. It comes with five different backgrounds and a ridiculous amount of stickers (that are trickled throughout our house at any given time). He plays with this every single day, which usually buys me a little time to sip on my coffee while I sit next to him and assist with sticker placement! It has also been helpful in growing his vocabulary, because we spend plenty of time thoroughly discussing each and every sticker. 04. Janod Magnetic Airplane: Janod is my favorite brand, hands down! Their stuff is well made and holds up to Liam's rough play. I have found that the paint on Melissa & Doug's wooden products doesn't hold up all that well; whereas, I have never had a problem with any of our Janod stuff. This airplane is a puzzle of sorts in that it is 6 different pieces that fit together. Liam likes assembling this airplane, giving it a quick fly through the air, and then sending it crashing to the ground. Wild scream, then repeat! 06. Finger Puppets: These are the most adorable (and well made) finger puppets I ever did see! I searched all over Etsy for the perfect set and settled on this shop. The shipping is a bit outrageous since they are overseas, but the original price is relatively low so I was okay with it. They fit well on kid or adult fingers and are great for some storytelling! What are your 1 1/2 year old favorites? Easter is right around the corner, so I need some fun ideas for Liam's basket! We love puzzles here too!!!! Have you seen the latches one, that iOS our fave!! And board books, can't get enough!! we have Janod blocks that we love- they are so cute! Oooh I might have to look into their blocks! Janod stuff can be hard to find sometimes, but luckily there is a little children's boutique in my hometown that always has tons of their stuff! Awww...I can't wait for this stage! My little guy is only 4 months old. But I'm going to have to get him one of those Janod fire trucks - that looks so cool! I just love those Janod toys. My kids are past this stage of toys, but I have a baby nephew to buy for. Boy the time flies. My youngest is 17 months old already! What does she enjoy? Everything her siblings have? From juice boxes, food, toys and clothes. ha. We don't have any of those toys but they look great!